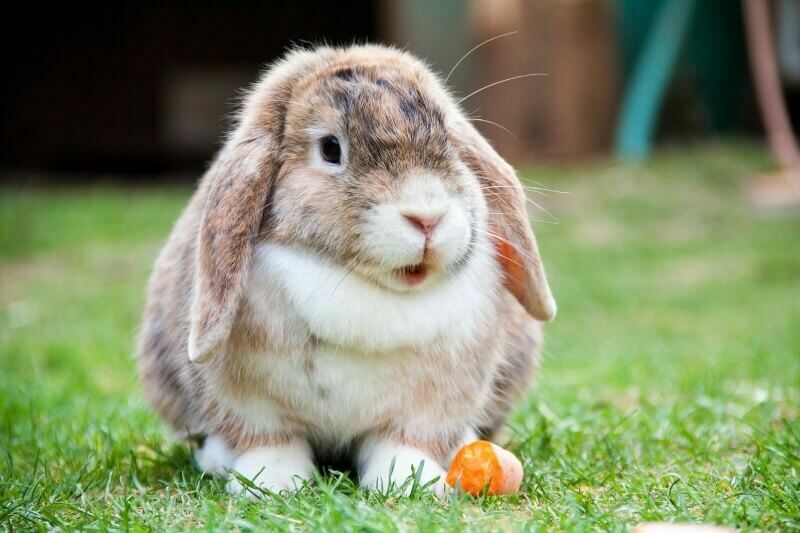 If you’ve decided that you will be keeping your bunny outdoors then you need to make sure that you are well prepared to ensure that your bunny is both healthy and happy outdoors. I’ve kept bunnies outdoors and it’s crucial that a bunny kept outdoors has a home that is clean and dry as well as secure and roomy. Also, the bunny’s home needs to be kept at a good temperature and not be too hot or cold. Even though your bunny is outdoors, that doesn’t mean that you can give him less company as bunnies don’t like to be isolated from other bunnies or from human contact. Even though your rabbit’s coat gets thicker during winter, your bunny still relies on you to keep him warm in the winter. This is because domesticated bunnies don’t have the benefit of snuggling up to fellow bunnies in an underground burrow. Read our rabbit care tips to make sure your rabbits are happy outside during winter time. Either attach legs or place bricks underneath your bunny’s hutch to raise it off of the ground. The reason for this is because it prevents any damp on the ground affecting the underneath of the hutch and prevents ground frost from freezing the bottom of the hutch. Additionally, if you live in an area that’s prone to flooding, this will protect the hutch. In general, hutches should also be kept off the ground to stop any predators from getting in. 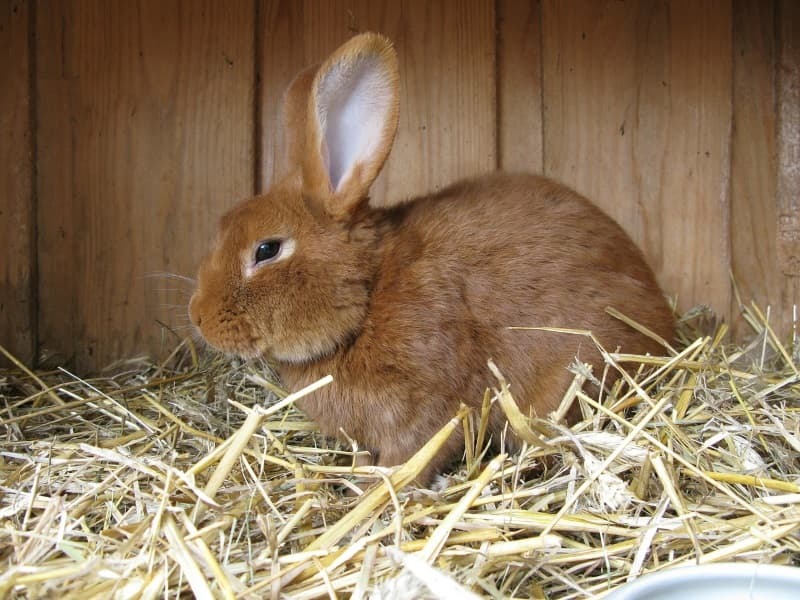 You need to make sure that there are no gaps in your bunny’s hutch so that rain or wind cannot get into the hutch. You can use newspaper to line the walls of the hutch. Check that the wood on the hutch is still in good condition and it’s not damp or rotting. Every few years you will need to apply a wood protecting coating, which needs to be rabbit safe. Once again, every few years the roof may need to be recovered with a tarpaulin or a plastic sheet to stop rain from entering the hutch. Additionally, you could place a blanket or newspaper between the plastic sheets on the roof for even more insulation. If it is possible, you need to move your bunny’s hutch to somewhere warmer in the winter months i.e. a shed or garage. Only place your bunny’s hut in a garage however if you do not use it to park your car in, as exhaust fumes can be dangerous to a bunny. If a shed or a garage are not an option to you then move the hutch to a spot with some kind of shelter i.e. facing away from the elements. Use a plastic sheet or some clear Perspex to cover a part of the front of your bunny’s hutch to protect your bunny from wind and rain. However, make sure that you leave some of the area uncovered so that light and fresh air comes into the hutch and your bunny can still see out of the hutch and can breathe comfortably. Another option would be to buy a waterproof hutch cover. Give your bunny a fleece or a blanket for him to snuggle into. Another option would be to line the floor of the hutch with these. Using newspaper to line the bottom of the hutch. Provide your bunny with extra straw or hay so that he can bury into it. Provide your bunny with a piece of carpet that he could sit on. Ensure that the edges of the carpet are not fraying. There are heat pads designed for small animals that can keep your bunny warm. You just need to warm these up in a microwave and they will provide heat to your bunny for a few hours. You may need to reheat this a few times each day. Close all four sides of a cardboard box and cut out a hole which is big enough for your bunny to climb into. Fill the cardboard box with straw or hay. This provides your bunny with an insulated area to sit in and feel comfortable in. If you have more than one rabbit then you will need to make sure that the box can fit them all in, whilst still making sure that they can stretch out in their hutch. The area where your bunny urinates needs to be kept clean as urine can freeze which can leave your bunny feeling very uncomfortable. Each day make sure that you check that your bunny’s bedding is clean and dry, as a bunny can get ill from sitting in wet bedding. Make sure that you regularly check that your rabbits water dish or bottle has not frozen. To prevent this, you can place a thick sock over a bottle or buy a bottle cover. A bunny still needs exercise in the winter so you will either need to let him have a short run outside, making sure that he doesn’t get wet, or bring him inside. If your bunny ever gets wet then dry him off using a towel and let him warm up inside. Don’t use a heater to warm him up, let him warm naturally. If your rabbit has an outdoor run then try and insulate it as much as possible and perhaps place the run in a spot where it gets some sunshine.